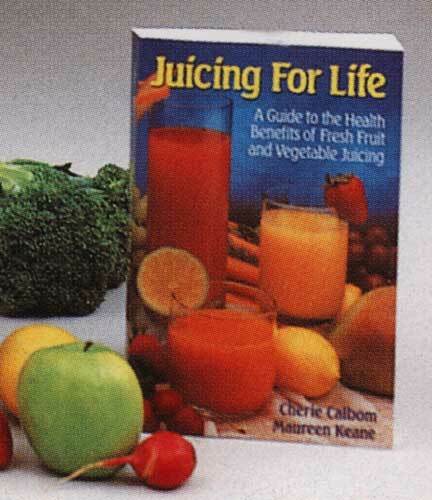 Juicing For Life: A Guide to the Health Benefits of Fresh Fruit and Vegetable Juicing. Did you know that eating fresh fruits and vegetables can boost your energy level, supercharge your immune system, and maximize you body's healing power? Who says so? The United States Surgeon General, the National Cancer Institute, Congress, the world's top scientists and medical researchers, and the most highly respected doctors and nutritionists all now endorse this approach to health. And how can you get the greatest benefit from fruits and vegetables? Through juicing--a convenient and inexpensive method of obtaining the most concentrated form of nutrition available from whole foods. With that in mind, Cherie Calbom and Maureen Keane, both experienced nutritionists, have created Juicing For Life, and A-to-Z guide to using nature's bounty in the prevention and treatment of our most common health disorders. Written in easy-to-understand language, Juicing For Life provides complete nutritional programs for dealing with over seventy-five health problems. It tells you what fruits and vegetables have been shown effective in combatting specific illnesses and explains why they work nutritionally. It provides dietary guidelines, detailing which foods to eat and which foods to avoid. It offers hundreds of delicious, nutition-rich juicing recepies to use daily. It also presents ten diet plans to follow in conjunction with your juicing regimen. Juicing For Life can provide you and your family with a safe, effective, and natural way of achieving better health. 351 pages.